In February 2015, I fought Local Government elections as an independent candidate for Mohali city. I wanted to prove the ideology, which I propagate through Bharat Udey Yug Kranti website (BUYK – Reformist Socio-Political Revolution in India). The basic ideology of BUYK movement advocates to discard party system for electing legislatures to Parliament and other governing bodies, while retaining the existing democratic framework of India. BUYK ideology advocates that a social activist should fight elections as an independent candidate and should be chosen on his merits and educational background. I fought Mohali Municipal Corporation elections, self financed and self-managed, but I lost election to BJP candidate. I did not win Municipal Elections but learned some valuable lessons and came to know about the psychology of voters in India. It was shocking experience for me, as voters started demanding liquor from me for casting their votes in my favour. Some voters asked for supporting the structural violations, which they have done against the guidelines of civic architectural bylaws. Where as some discouraged me by saying that politics is not for honest and law abiding people, its gunda people who rule the roost. Since. I was emotionally attached with Jan Lokpal andolan and was already actively supporting online campaigns in their support on 1st March, 2015 I joined Aam Aadmi Party (AAP) “Common Man’s Political Party in India”. 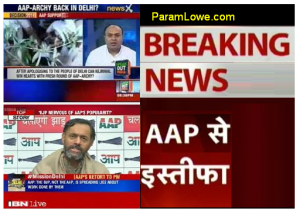 In the mean while some internal conflict of AAP came to surface and party looked split apart in to two factions. On one side were close friends of Mr. Arvind Krjriwal (founder member of AAP, the nominated leader of AAP, one of the popular faces of Anna Hazare’s Jan Lokpal andolan) and on the other side people like Mr. Yogendra Yadav (founder member of AAP, an intellectual person, political thinker and analyst) and Mr. Prashant Bhushan (founder member of AAP, an intellectual person, big lawman, political activist, spokes person of Supreme court on TV). Even before Delhi Vidhan sabha elections, I was raising my voice against Mr. Kejriwal being made a celebrated leader at par with the leading faces of other political parties like Mr. Narendra Modi for BJP and Siniora Sonia Gandhi and mio amico Sinior Rahul Gandhi for Congress Party. After reviewing social media posts and watching so called sting videos on TV news channels, I realised that AAP and its “governing men” have divulged from Lokpal ideology, so I decided to resign from AAP membership on 30th March, 2015 and decided to go back to my political reformist agenda being propagated through BUYK website. Here under is the excerpts from emails I wrote to Aam Aadmin Party and replies. 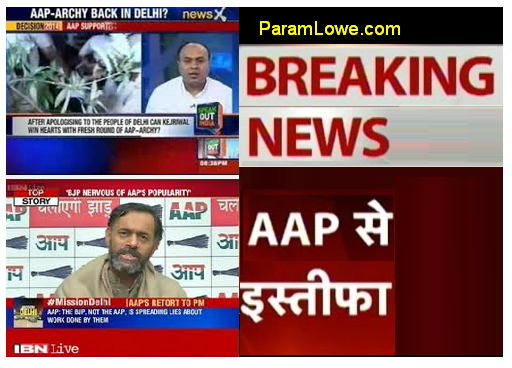 Both Mr. Yogendra Yadav and Mr. Prashant Bhushan have been expelled from all the important decision making bodies of the AAP. Inspite of our best efforts, we have gone past the point of no return. It was not just one or two isolated incidents that compelled Mr. Arvind Kejriwal to take this decision. A sustained campaign was being run to discredit Mr. Kejriwal and remove him from the post of party convener. In these circumstances, Mr. Kejriwal was left with no alternate choice and his decision had the backing of the overwhelming support of the majority of the NC members present in the meeting. The link below will give you a fair idea of the feelings of Mr. Kejriwal, before he took his final decision on the matter. We hope you understand the situation. I understand your point and I have no doubt about Mr. Arvind Kejriwal ji’s honest working towards benefiting people of Delhi. Neither I hate him. The thing is, your point of view is of a Loyal member of an organisation/Party, whereas my point of view is of a Patriot. My love for Motherland is beyond any party or personality. I am one of those people who were emotionally attached with Jan-Lokpal andolan. And this is not just a name tag. The dream of a rising nation always resides in my heart. Even when I was younger the term “Ram-Rajiya” coined by BJP, raised same hopes as is done by Jan Lokpal. We all want to build a nation of our dreams. Our dreams consists of Social and Economic just full society. Economic corruption is just a single fault of many maladies of modern Government system. The dream to fulfill the objectives of Jan Lokpal can’t be realized by following the prevalent political culture of Authoritarian style of leadership, like we see in major Political parties of India. Our beloved Arvind Kejriwal has trodden the same path and is now disillusioned by unparalleled success of Aam Aadmi Party in Delhi. But he should remember that people’s power is the force behind crowning and de-crowning of the Kings. If I had seen our comrade driving away from the fundamentals of Jan Lokpal ideology, I would have done the same like Yogendra Yadav ji and Prashant Bhushan ji did in Delhi elections 2015. I have mindset of a patriot soldier who fights under the command of another soldier for the sake of his motherland. And if he sees his commander deluded from the right path the patriot soldier takes his own stand. I am thankful to my parents that they were not loyalist to any political party and am also raised to be free thinker. Sanatan Dharma based schools have inculcated patriotism in me. At present, Politically I am not a “crowd puller” so it is irrelevant for any party whether I remain their member or not. Though Atman says “Conscious is my play-ground and I build societies to my own benefit, for I come time and again to rise back to my full glory.” I think AAP will do fine without a “aam aadmi” like me. Please consider my resignation from Aam Aadmi Party membership. My Best wishes to Aam Aadmi Party.